I’m glad I am finally back to blogging about our trip to Japan. Frankly, I need to do this before I totally forget names, places and other information I consider as important highlights of our trip. I’m actually looking at this series as my online travelogue that will remind me of the wonderful experience in Japan. Before I answer that, I must tell you that we found out about this place from Anthony Bourdain’s show called No Reservations and the episode was about Tokyo. It was a destination we knew we didn’t want to miss so it was immediately added to our Tokyo itinerary. So when the time came, our determination to eat there was uncompromising. However, the place wasn’t that easy to find. Even though we knew the address, we still didn’t know fully well how to find places as addresses in Tokyo are confusing and the numbers are not sequential. It didn’t help either that we can’t read characters or speak Japanese. Eventually we found the place through the help of another restaurant we went into thinking it was the right place. Now that’s another story in itself! 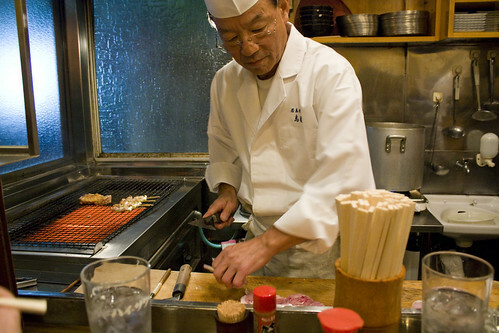 Toriki is a small, unassuming restaurant that is very popular with locals as the best place to have yakitori. As Anthony Bourdain’s travel guide pointed out, their specialty is creating yakitori from all parts of a chicken — skin, hearts and liver included. We were glad to be asked to sit by the counter as we wanted to watch the chef (and owner) skillfully cut, debone and prepare the chicken pieces as they are ordered. The chef himself is a wonderfully jovial host and also a performer. It was entertaining to watch him cut and tear the chicken apart from the carcass while he’s cooking various pieces on the grill. The chef has the knife skills of a Samurai. We ordered a few items and while waiting, they served us nato with raw egg and some green onions as appetizer. Nato is made of fermented soy beans and is covered with a mucous like substance. I must say that nato is an acquired taste but it’s definitely worth trying. They told us to mix the whole thing together and put some soy sauce for some added flavour. It actually looks pretty good, isn't it? The second course they served was chicken sashimi. Chicken breast lightly seared on the outside and raw on the inside. Yum! Really, it was actually delicious. No worries about salmonella here as the chef kills and prepares the chickens himself every morning so they’re really fresh. The third course was chicken yakitori. 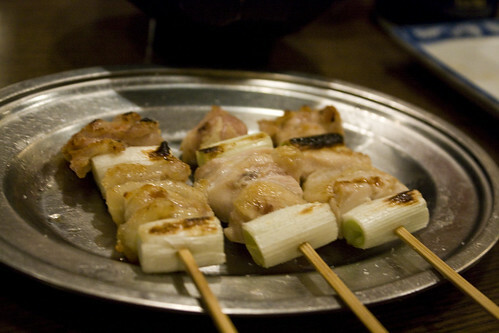 These are grilled chicken pieces in a skewer with green onions. Simply prepared but really, really good. I’m practically salivating just thinking about them now. We also ordered something that we normally throw out or usually choose not to eat when having chicken back home — chicken skin. This time we ate every morsel! 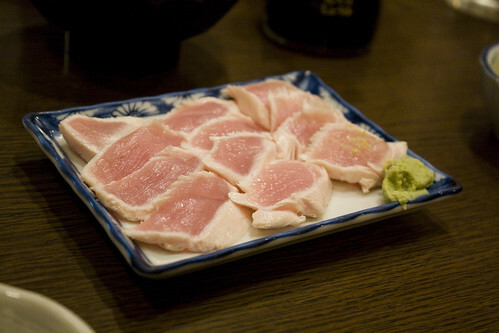 The chef saved the best for last — chicken tataki, which is from Toriki’s original menu. The chicken is seared on the outside but the meat is cooked medium rare. Two words — juicy and succulent. Need I say more? If you plan to visit Toriki, be aware that the place gets pretty busy. Hence, the reason why we were there at 6 pm. As with most independent bars and restaurants in Tokyo, the space is usually tight and crammed. You may even be asked to move a little bit while eating to accommodate one more person on the table or the counter. There are a number of ways. However, if you have a JR pass like we did, the easiest way is to take the train on the JR Yamanote Line which stops at Gotanda station. From there, take the Tokyu Ikegami Line (not covered by the JR pass) that stops at Hatanodai station. Across from the entrance/exit to Hatanodai station is this inconspicuous, dimly lit street. Go down this street and after a few steps, you should be able to see the restaurant on the left. I have attached the Google Street View below for a visual picture of this street. You’re welcome. This entry was posted in Places & Travel and tagged chicken, Food & Drink, Japan, restaurant, Tokyo, Toriki. Bookmark the permalink. Post a comment or leave a trackback: Trackback URL. I love yakitori and this will definitely be a stop on my seventh trip to Japan, but I know how difficult it can be to find an address there. So thanks for the detailed directions and map! You’re welcome and thanks Filbert for visiting! Good luck in finding this place. It’s definitely worth going there. You’re welcome Trang! Savour every bite, every morsel. It looks so good! Was it expensive? It was really good. I wish we went back for the second time before we left. It wasn’t that expensive. The best thing was the chicken pieces were really fresh and it was a delight to see him take the meat pieces off the bone. I was recently watching the re-run of Bourdain’s show (which I had seen before) that showcased this restaurant. Looks great. Thanks for sharing your experience. I definitely would love to eat there when I go back to Tokyo. I absolutely love yakitori. Thanks Peter for visiting. 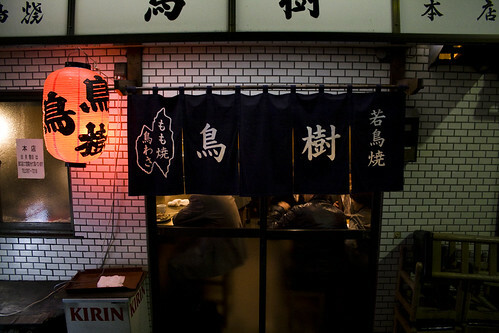 I love yakitori too and I hope someday I’ll be able to go back to Tokyo. on my way there this evening, saw it on Bourdains show and you have the directions cheers mate. No problem man. I hope you had a great time there. We visited Toriki on our recent trip to Japan. Toriki is awesome. We got there a bit early on a Tuesday which was also a national holiday. Twas empty until about 7pm when it began to fill up. Tataki is the best especially the sauce you pour on it. Skins are also delish. The natto is pretty raunchy. 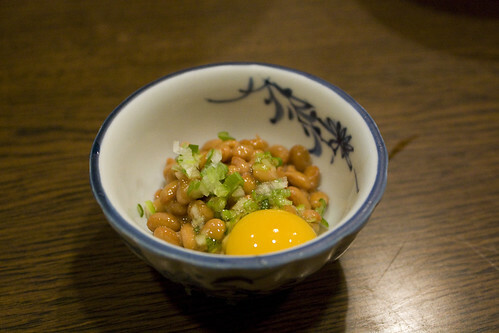 Wifey loves natto but theirs is a bit runny and flavorless. We could not get ourselves to finish it. Wish we had Toriki here. The map is a little bit off. It’s actually the street below(south) of the one shown. Just go down the alley with KFC on the corner and on the left(north). I agree. Tataki is the best and nato was definitely an acquired taste. We managed to finish it though. Yes, the map is a little bit off and it’s kinda hard to make it point to the actual place. Google Street View didn’t go down this road so you only go as far as KFC. Thanks for the additional instructions. Hi, I’m thinking of visiting Toriki when I visit Tokyo again. I was wondering, how much did you spend at Toriki and how did you make your orders, since I read that they only have Japanese menus. Hi! For all the items we ordered, I believe we spent about $40 (Canadian). They do have menus in English and the owners speak a little bit of English too. Have fun!